Communication Service Providers (CSPs) have been facing challenging times in the market with greater competition and near identical services offered by fellow CSPs. The only way to gain a competitive advantage in order to increase value to all stakeholders, is to establish loyalty amongst existing subscribers and to attract new subscribers. Traditional revenue streams are stagnating whilst operational expenses are on the rise. Bottom lines should therefore be increased by supplementing traditional revenue streams with novel and improved service offerings. Even minor modifications to services are handled as costly change requests by the vendors increasing OpEx. This introduces greater risk when introducing new services since modifications are costly and difficult. Increased security threats and difficulties in managing and monitoring network integration APIs. Fusion Studio is a highly intuitive service creation and service execution environment for omnichannel services. The service creation process is simplified by providing a visual builder which uses pre-configured components that can be the dragged and dropped on an easy to use GUI to build, stage and deploy service flows. This minimises the need to code every line of a service flow. orchestration of services in the multiple customer interaction channels with back end OSS and BSS. Following the consolidation principles mixed with Micro-Service architecture Fusion presents a robust, flexible all in one solution for service creation. Operators are empowered to bring their business ideas from their Marketing teams to their subscribers by employing the Fusion Studio SCE (service creation environment) and SEE (service execution environment). The process is streamlined and made less time intensive where by a business logic can be transformed into a service call flow using the visual builder and pre configured components in the SCE. The user can stage the service flow to gauge an understanding of its functions and if it is executable as per original business idea. The Fusion studio acts as the middle layer between the last mile connectivity channels and the underlying OSS and BSS. 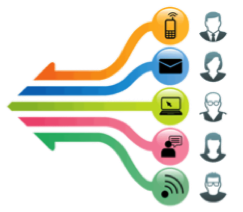 The service flow once created as a hybrid flow can be deployed in any channel of choice accessible by users. MNOs are given the flexibility to either build their own service flows or consult Wavenet application development team for application building. The omnichannel offering allows Operators to offer self services both from legacy and digital interaction channels. Subscribers who are more familiar with legacy channels such as SMS, IVR and USSD can use those channels whilst the more tech savvy of the subscriber base can use digital channels like self care apps. Since the call flows for all the channels are created as hybrid service flows, where one call flow would be used to build the service logic and can be implemented in a channel of choice. This brings an unmatched level of consistency across all the channels for the service flow and subscribers will have the same experience irrespective of the channel used. Through the API aggregator the following capabilities are introduced. The visual call flow builder allows for options such as dynamic menus to be added which brings greater flexibility to anyone building the call flow to modify the call flow as per his/her preference. This allows for greater variety to be added to a basic call flow and allows for intelligent handling of subscriber queries. This added touch of personalization will elevate the service offering to the next level. Since all of the data goes through a single point which is Fusion Studio, comprehensive reporting is facilitated, which allows Operators to gain insights into the use of their channels and for which specific services. Having a holistic view of the entire service layer will empower MNOs to identify key trends and user behaviours. For e.g. 360 degree view of all the services, short codes, usage details such as success rates and failure rates to provide an in-depth view of subscriber use of the services. Fusion Studio functions in perfect harmony with Wavenet Prime Messaging Server and Wavenet Spark IPMS platform. Value creation is enabled with smooth integration to external applications via web services. External applications can be called at any point of the call flow by REST/SOAP APIs by using the Web Service component or the REST component. The service creator can determine inputs, outputs and which action to call. Fusion Stack acts as the middle layer between OSS/BSS level applications and the main Operator network infrastructure. CSPs can design and create the service flow of choice be it USSD, SMS, IVR or Mobile App in the Fusion Studio service creation environment using the simple to use drag and drop pre configured components in the canvas. Fusion studio is a desktop client which can be setup in any Windows PC or laptop. Services can be created offline and be deployed in to the Service Execution Environment when available. Fusion studio created services will be managed and monitored via the Fusion admin interface. This interface access will be controlled based on multiple permission levels. The admin interface allows users to analyze call detail records and reports for system health and performance. Control of the multiple reporting points can also be configured through the interface which allows the system to generate hit counters for predefined locations in a service flow. Once the service flow has been created, it can be staged and/or deployed in the service execution environment. If needed, a hybrid call flow can also be executed for USSD, IVR and Mobile app services. Last mile connectivity is provided via Prime Messaging Server for messaging services using SIGTRAN/MAP protocols while Spark IPMS is utilised for IVR service call flows using SIP/RTP protocols. For Mobile App connectivity, an App enabler would send requests to applications via HTTP interface. Integration to backend applications is handled smoothly using web services and other APIs. 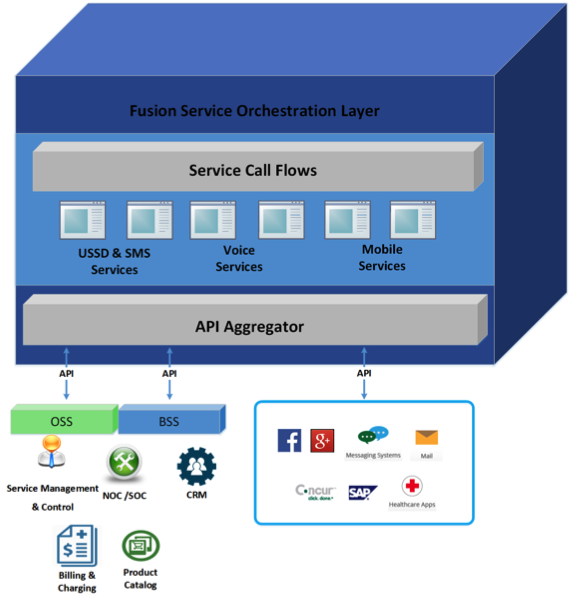 Charging handled by OCS is connected to the Fusion Stack via CAMEL/DIAMETER protocols to ensure accurate charging of the subscribed services. SOAP/REST APIs are used to connect to backend Customer Relationship Management(CRM) systems to bring a greater level of intelligent management of subscriber profiles and services. The Fusion Stack is also integrated with both internal and external databases. 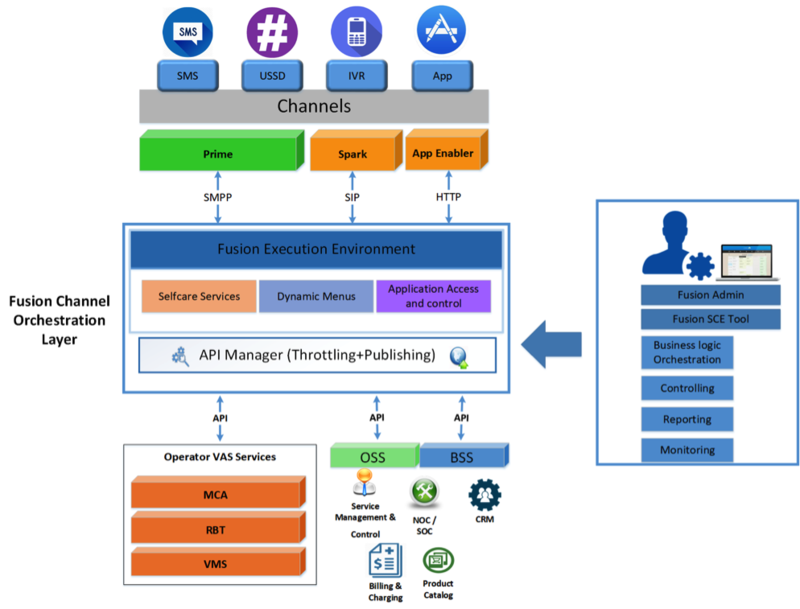 Fusion service layer can also be used to create access channels for existing VAS applications such as VMS, RBT and other services.